A nourishing, oil-infused shampoo provides smoothing and frizz-calming properties for soft, supple, free-flowing hair, without stripping away natural oils. 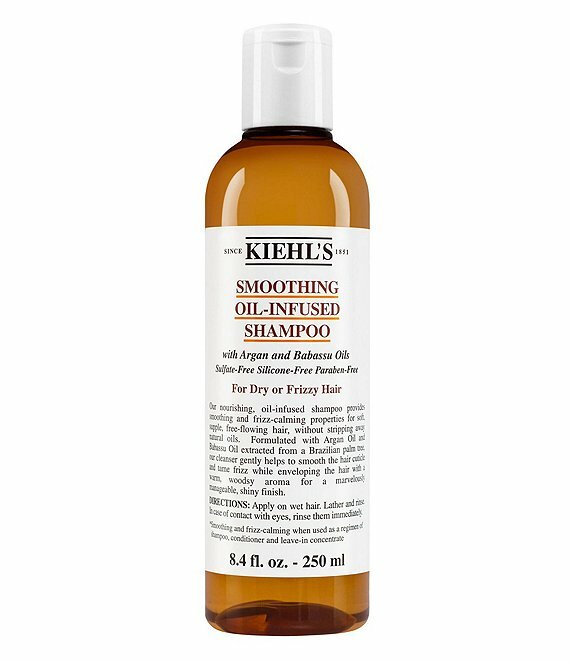 Formulated with Argan oil and Babassu oil extracted from Brazilian palm trees, Kiehl's cleansing formula helps to smooth the hair cuticle and tame frizz while enveloping the hair with a warm, woodsy aroma for a marvelously manageable, shiny finish. Fair Trade Argan Oil - Argan Oil (derived from the Argan Tree) has been valued for centuries and commonly referred to as liquid gold for it's naturally rich poly-unsaturated fatty acids, including Tocopherols (Vitamin E), and Omega-6 and Omega- 9 fatty acids, which are known for having restorative and protective properties on the skin and hair. Skincare Grade Babassu Oil - Oil extracted from the fruit of the Babassu tree found growing in the Amazon rain forest. It is known for its skin and hair moisturizing properties, which leave hair feeling soft, silky and smooth.